While working at the Building Engineering College in Weimar, Wilhelm Wagenfeld created these floor and table lamps with fabric lamp shades. The visual similarity to the Bauhaus table lamps demonstrates Wagenfeld�s constant desire to refine and experiment with his designs. Sole copyright and authorized edition by Prof. Wilhelm Wagenfeld. Nickel plated metal, glass tube, glass base, chintz covered shade with conical shade support. This "lamp de travail" or work lamp, was created in a number of diverse but similar designs, and was widely used as a work lamp in offices. With a height of 30.42" it is neither a table lamp nor a floor lamp, although it is especially suited for low tables. A soft light is diffused through the room through the opaque shade which is open at the top. As was common in the 1930's, the metal surfaces have received different finishes; nickel plate alternates with a chrome plated surface. Chrome plated base and tube, Nickel-plated upper base plate and socket, opaque glass. Designed by Wilhelm Wagenfeld in 1924, when he was 24 years old. He had just been admitted as a journeyman to the Bauhuas workshop in Weimar, where he designed the first model of this lamp as his solution to an assignment given to him by Maholy-Nagy. As Wagenfeld said, the Bauhaus designs were intended to be industrial products, and indeed, looked like it. They were in fact, hand-crafted. Today, as well, this lamp continues to be manufactured on this basis, following the original specifications for dimensions and materials. Nickel plated metal, opaque globe. Chrome plated metal and brushed aluminum. Chrome plated metal parts, opaque glass. AD-32 Chr/M Chrome plated metal, polished and varnished brass bases, opaque glass. The design of this lamp originated with the group of architects who were active in Swedish functionalism and contemporary with the Bauhaus. The polished aluminum cowl is held on the glass by friction alone. The reflector can be adjusted as desired for glare free illumination. Chrome plated or black lacquered metal, polished aluminum, opaque glass. The light source is hidden behind a vertical cylinder, standing on a round base. Behind the cylinder is an asymmetrically mounted, adjustable, white lacquered disc, which spreads a soft light. Chrome plated metal parts, white lacquered reflector. Polished and varnished brass, white lacquered reflector. Chrome plated metal, black lacquered reflector, brass joints. This lamp was originally described as a "bedside lamp to be used also as a wall fixture". It is also suitable as a piano or shelf lamp. The original drawings from 1930 were made available to us for this reproduction. Nickel plated metal, opaque glass. Chrome plated metal, black lacquered wood. Silver plated metal. Includes bulbs. Nickel plated metal. Includes bulbs. Chrome plated metal. Includes bulbs. In 1927, Mart Stam, who directed a number of courses at the Bauhaus during the late 1920�s as a visiting lecturer, designed this beautiful wall sconce in nickel plated metal. Synthetic tube, with electronic transformer for dimmer. This floor lamp, now manufactured in series for the first time, was designed by the Hungarian Gyula Pap at the metal workshop of the Staatlichen Bauhaus in Weimar. One model of this lamp was found in the famous Bauhaus model home "Haus am Horn." The reproduction is faithful to the original, following Pap�s specifications, and with the permission of the Bauhaus Archives in Berlin. Lacquered black iron, nickel plated brass, frosted glass plate. Silver plated metal. Includes bulb. Nickel plated metal. Includes bulb. Chrome plated metal. Includes bulb. While working at the Building Engineering College in Weimar, Wilhelm Wagenfeld created these floor and table lamps with fabric lamp shades. Nickel plated metal, black lacquered base, chintz covered shade. 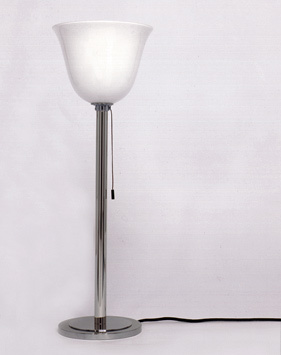 Adjustable floor lamp with opaque glass globe. Nickel plated metal and opaque glass. The original of this lamp, from the periphery of the Bauhaus, shows typical construction details from the early Bauhaus period. Wall fixtures with similar mechanics were designed by Marianne Brandt and K. J. Jucker. Black lacquered metal, nickel plated metal, lacquered brass, opaque frosted glass. Designed for the restaurant "Le tre streghe" (the three witches) in Hamburg. Chrome plated metal, hand made murano glass globe. Includes bulb. Gold plated metal, hand made murano glass globe. Includes bulb. Nickel plated metal parts, opaque globe. Polished and varnished brass, opaque globe. Chrome plated metal, frosted glass plate. Max 6 x 100 W bulbs. Longer or shorter pendant available with surcharge. Max 4 x 100 W bulbs. Longer pendant available with surcharge. Material: Nickel plated metal parts, opaque globe. Pendant lamp with glass globe made of two kinds of glass. Underpart opaque glass and upperpart frosted glass. Ceiling lamp with cylindric opaque glass shade and frosted glass plate. Nickel plated metal, opaque glass and frosted glass. Polished nickel. With pulley and counterweight. White lacquered aluminum. With pulley and counterweight. Polished nickel. Without pulley and counterweight. White lacquered aluminum. Without pulley and countgerweight. Chrome plated metal, clear glass. Polished and varnished brass, clear glass. Ceiling lamp with cylindric opaque glass shade. Table lamp made of plexiglass stripes with cable dimmer. Table lamp made of plexiglass stripes, with cable dimmer. Pendant lamp made of flexible plexiglass strips.